Globe Telecom offers Globe GoSURF for Prepaid Subscribers where you can enjoy consumable mobile internet surfing. Get the latest updates and happenings on your favorite social networking sites and an easy access to experience Spotify. You can do more with Globe GoSURF! Tweet, e-mail, Facebook and more! Explore the world of music with Spotify where you can discover new music and artists, create your own playlists, share music with friends and stream music all day for free! Choose the promo that suits your lifestyle. 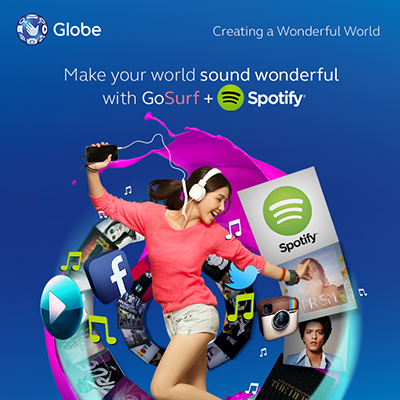 Make your world even more exciting with Globe GoSURF for Prepaid Subscribers! Visit www.globe.com.ph for full details and Globe Telecom Facebook page for the latest updates. Promo runs until June 30, 2014. Per DTI-NCR permit number 3165, series of 2014.
so how about the tattoo sim? How can we register?? Is the GoSurf299 still unlimited? ang gosurf50 ay mka open ng mga games sa fb in 1 day? Nakaregister po ako sa GS99 with a youtube freebie valid till sept.22 2016. Nagtext ako sa 8080 GOSURF STOP yesterday sept 21 at nag register ulit ako ng GS99. My question is Bakit hindi na ako nakpili kung what ang freebie na gusto ko? Nagtext ako sa 8080 GOSURF STATUS. Im regitered n daw at may freebie sa youtube valid till oct.21 2016. Pwede ko pa bang baguhin ang freebie ko? free fb na ba yung gosurf15? Bkit po wla na un free unlitxt po to all net ang gosurf15? 599 gosurf promo, 4gb a day or 4gb the whole month na?